Everyone who talks about creating a work of art winds up using the analogy of birth at some point, but there are some very big differences in my opinion. One of them has to do with labor. The really hard work of having a baby all comes at the end. It’s very intense, but compared to gestation, it doesn’t last long. A painting, whether it takes nine weeks or nine months, involves constant labor. Of course, it’s not as physically demanding, but it can be very tiring. The big difference is that in childbirth, all your awareness is focused on your labor. In artbirth, your consciousness is on something else – intensely – and it takes a while for the physical effort to make itself known. But sooner or later, you notice your back aches, your shoulder is stiff – and at the same time the painting itself is telling you that it’s time to stop for the day. Enjoy your astute writing re. the labor of birthing. I congratulate you on doing both kinds. 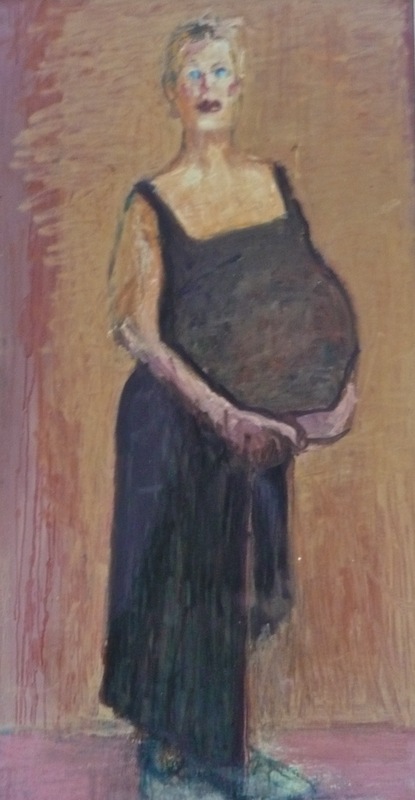 Striking portrait of the very pregnant woman!